Shareholders have lodged a resolution with Commonwealth Bank, proposing that directors should manage the company in line with the goal of holding global warming to less than two degrees. Click here to see Market Forces’ media release about the resolution. Click here to view the resolution and supporting statement. Just a few days ago we were celebrating a win, with Commbank having joined its big four counterparts and finally ruled out lending to Adani’s Carmichael mega coal mine. But the celebrations were short-lived, as the bank this morning proved itself to be the most recalcitrant of the big four when it comes to climate change. Released today, Commonwealth Bank’s Climate Policy Position Statement fell well short of its publicly-made two degree commitments. Consisting of a single page of text, the position statement failed to place any tangible constraints on lending to fossil fuels, leaving the door wide open for Commonwealth Bank to continue lending to projects that expand the scale of the fossil fuel industry. Clearly Commonwealth Bank doesn’t get it. Two degrees means no new fossil fuels, but the bank has failed to connect those dots, and left the door open to funding more climate destruction. 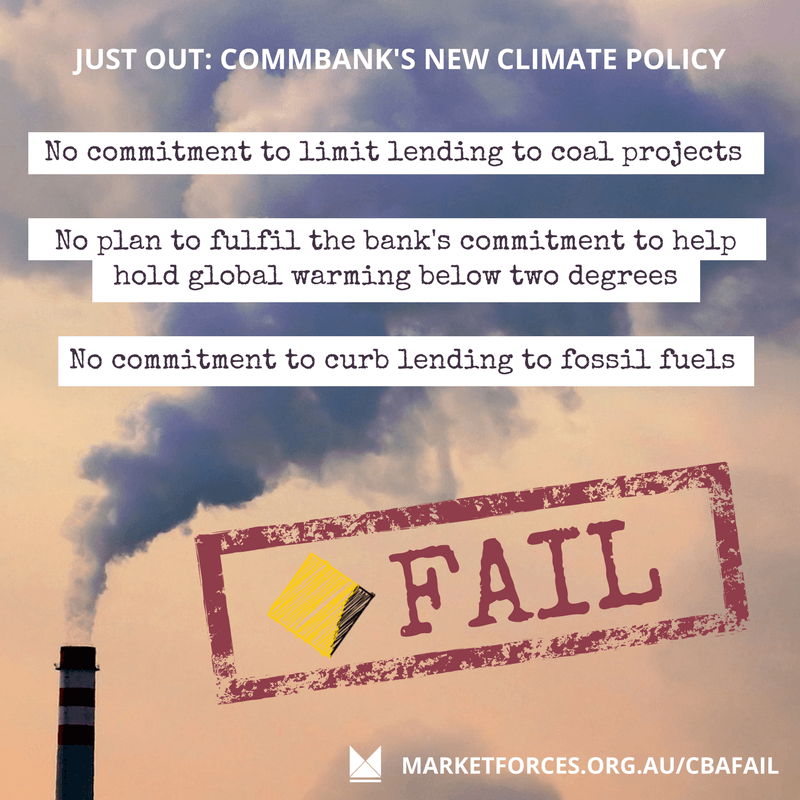 Take action: tell Commbank 2 degrees means no more fossil fuels! An aspirational target to reduce the average emissions intensity of the bank’s business lending portfolio, a target that could be achieved simply by lending to one solar farm. Our analysis shows that, since Commbank made its 2015 pledge to uphold the Paris Climate Agreement, it has poured $6 billion dollars into the fossil fuel industry, more than four times the amount invested in renewable energy. This trend would not have been altered by the presence of the position statement released today. The new fossil fuel projects financed by Commonwealth Bank will produce enough CO2 over their lifetimes to cancel out Australia’s 2005-2030 emission reduction goal twice over. Undermining Australia’s efforts to reduce greenhouse gas emissions is hardly the behaviour of a major financial institution apparently on board with the goal of keeping global warming below two degrees. Unlike the bank’s peers in Australia and overseas that are taking concrete steps to avoid the most carbon intensive sectors, Commonwealth Bank clearly lacks either the interest or competency to fulfil its commitment to help hold global warming below two degrees. Use the form above to contact Commonwealth Bank and voice your disappointment with the new position statement, and call on the bank to rule out lending to all new fossil fuels.